1. 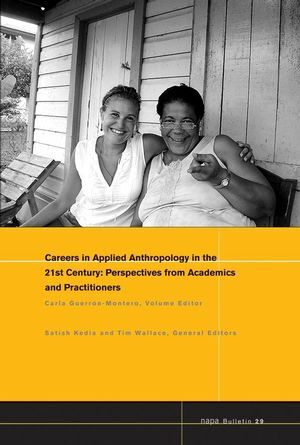 Introduction: Preparing Anthropologists for the 21st Century (Carla Guerrón-Montero). 2. Recent Changes and Trends in the Practice of Applied Anthropology (Satish Kedia). Part II: Graduate School in Applied Anthropology. 3. Mastering the Art of the M.A. Program and Beyond (Terry Redding). 4. Small Fish in a Big Pond: An Applied Anthropologist in Natural Resource Management (Jennifer Gilden). Part III: Advice from the Academy. 5. Practicing Anthropology from within the Academy: Combining Careers (Philip D. Young). 6. Moving Past Public Anthropology and Doing Collaborative Research (Luke Eric Lassiter). 7. Collaboration, Cooperation, and Working Together: Anthropologists Creating a Space for Research and Academic Partnerships (Geraldine Moreno-Black and Pissamai Homchampa). 8. Learning Applied Anthropology in Field Schools: Lessons from Bosnia and Romania (Peter W. Van Arsdale). Part IV: Advice from Practicing Anthropologists. 9. Working for the Federal Government: Anthropology Careers (Shirley J. Fiske). 11. Creating Your Own Consulting Business (Carla N. Littlefield and Emilia González-Clements). 12. Using Anthropology Overseas (Riall W. Nolan). 13. Becoming an International Consultant (Gisele Maynard-Tucker). 14. Further Resources for Careers in Applied Anthropology (Scarlett Shaffer).